Two finely bound volumes of Gützlaff’s work, complete with one large folding map and 10 folding tables. ‘In Tess, Hardy presents a world in which the human spirit is battered down by the forces, not of fate, but of social hierarchy. Tess’s eventual death, one of the most famous in literature, is a direct result of human cruelty and as such represents one of the most moving indictments of the lives of nineteenth-century English women in all of literature’ – Alvin Birdy. ‘O wonder! How many goodly creatures are there here! How beauteous mankind is! An exceptional copy of the first edition, in a bright example of the iconic dust jacket, without restoration, price-clipping or technological modification. Housed in custom made clamshell case of fine blue morocco leather over matching cloth, velvet lined, and lettered in gilt to the spine. A modern highlight, and landmark of 20th century fiction. Huxley’s bitterly satiric account of an inhumane society controlled by technology, in which art and religion have been abolished and human beings reproduce by artificial fertilisation. ‘Brilliantly plausible fantasy... a Utopia which is never dull, of which the horror is always credible as one’s sympathies grow more involved with the fate of the young primitive from the Indian Reservation who challenges the machine.’ – Cyril Connolly, Modern Movement. 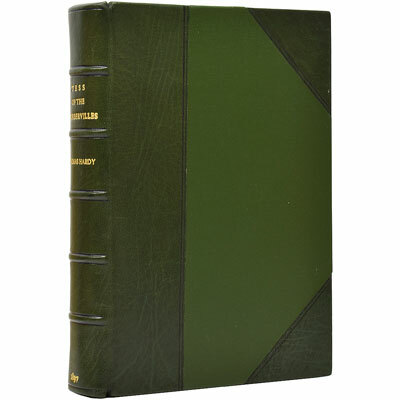 A clean example of this profusely illustrated and important work in contemporary full calf binding. First published in Dutch (1704) to which the translator added the illustrations for this first English edition, consisting of 30 newly engraved plates (seven of which are double page folding plates, and one larger folding plate ‘The Ambassador’s entry thro’ the famous wall’), in addition to the engraved title page, and the large and important map ‘Russorum Imperatori’ by Petro Alexewitz, considered ‘the best of all foreign maps which were based on the Russian original sources and which have exercised a great influence on the development of Russian cartography’ (Imago Mundi III 87). Ides headed an embassy to Peking, which set out from Moscow in 1692 and returned in 1695. ‘He composed his journal for the information and satisfaction of Czar Peter the Great who was well pleased with the results and rewarded the author with the post of Privy Councillor. The Russian embassy had less trouble with the enormous self esteem of the Chinese than many earlier and later embassies. Under the emperor then ruling, Kang hsi, ministers were courteously received and enabled to transact their business as at any other court. The expedition added considerable geographical knowledge to the little that was known about Manchuria and China’ [Cox]. An early edition, brilliantly illustrated throughout with small sketches and full page plates by A. Frederics. Finely bound, and profusely illustrated with mostly black and white photographs, as well as maps of the Forbidden City, facsimiles of court documents, and a two page ‘Pedigree of the Manchu Emperors’ chart. As the British-born Tutor to the Dragon Emperor, Johnston was, alongside the Empress's American tutor Isabel Ingram, the only foreigner in history to be allowed inside the inner court of the Qing Dynasty. Johnston carried high imperial titles and lived in both the Forbidden City and the New Summer Palace. Twilight in the Forbidden City reflects his eyewitness accounts of the memorable events of the time. He provides an first hand account of daily life in the Forbidden City, the Summer Palace,and gives many detailed descriptions of ceremonies including Pu-yi's wedding. Johnston provides a good deal of anecdotal material for the last days of the Ch’ing Dynasty court before the 1911 Revolution He knew many of the active players in those events, and of historical significance are his observations on the Ch'ing court's political structure, and in particular the Nei Wu Fu or Imperial Household Department. 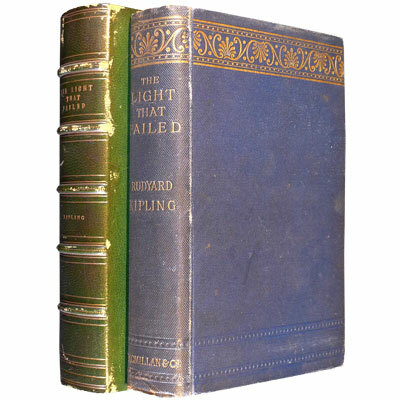 The first complete edition, of Kipling’s first novel, written when he was 26 years old, housed in bespoke sheepskin lined green morocco leather slipcase. With all fifteen chapters and the ‘sad ending, together with the first appearance of the poem ‘Mother O’ Mine’, as opposed to the 12 and 14 chapter American editions of December 1890, both ‘Disney’ versions that omitted the sad ending. In Stewart’s variant a binding of blue cloth with the 56 page publisher’s catalogue dated February, 1891. ‘In 1890, Rudyard Kipling was living in two rented rooms above a sausage shop in Villiers Street, next to Charing Cross station, when he was commissioned to write a novel for Lippincott's Magazine. He worked to an exacting deadline of three months as he grappled with the most complex problem of his literary life. The result was The Light that Failed, a richly revealing, semi-autobiographical novel, which, though badly reviewed, has stayed in print for more than 100 years. The spark that ignited it was the reappearance in Kipling's life of his first love, Flo Garrard, and her crippling second rejection of him.’ – Jad Adams, The Guardian (January 2006). A fine first edition, uncut and unopened, housed in bespoke sheepskin lined leather slipcase. Also included is the publisher’s loose four page catalogue and order form, announcing the publication of ‘Mr. Kipling’s new book of verse’ - ‘The Five Nations’. The ‘Five Nations’ which Kipling here celebrates were Great Britain and its colonies Canada, Australia, New Zealand, and Cape Colony in South Africa. Consisting of 54 poems, 28 of which are had not been published before in any form, eight had not been published in book form, and three were expanded from chapter headings in Kipling’s wonderful ‘Kim’.